Like I've stated before, I started making these cards to entertain myself, so even if I was the only one who dug them that would be cool with me. They're cards I'd want to own even if it wasn't me making them. Along the way I've had some really positive feedback from lots of different people about my cards, which is so cool. I never really bargained on that. What I really didn't plan on was gaining a celebrity fan along the way, especially if said celebrity had a lead role in my all-time favorite movie! When I first started making my custom cards I just wanted to send them out in the mail and cross my fingers that they come back signed. 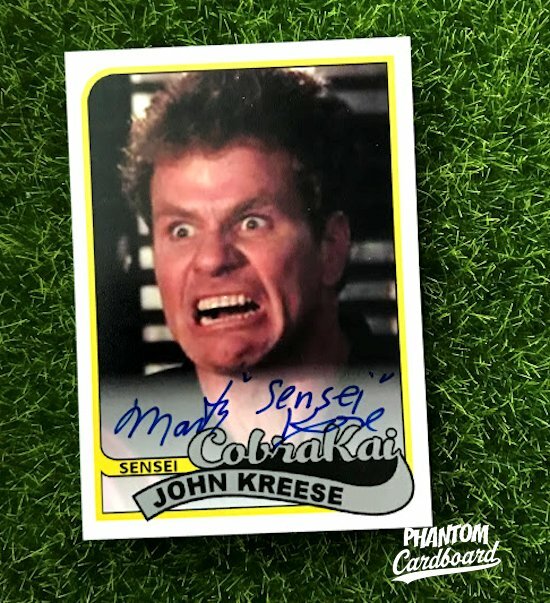 I've had my fair share of successes, but none like the responses from Mr. Kove. 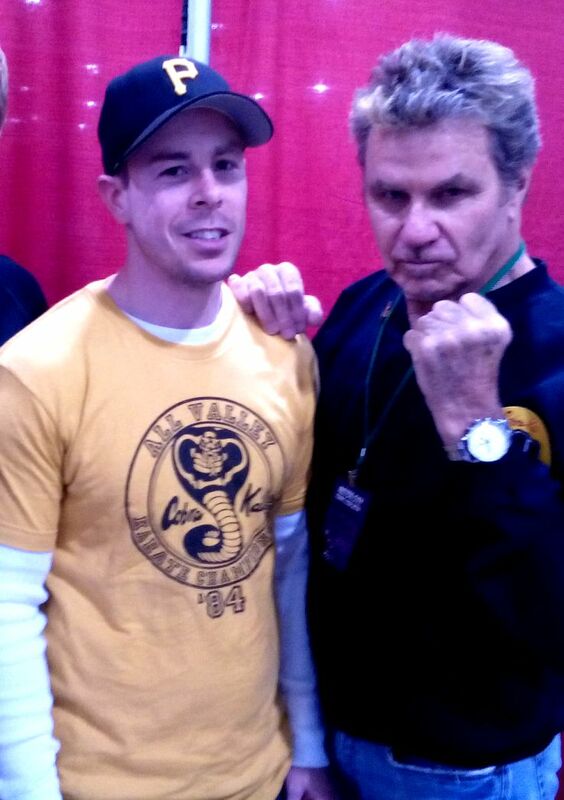 I've actually met Martin Kove twice, both times at the Motor City Comic-Con. My first time going to a Comic-Con was 2014. I went with a couple of buddies who were Comic-Con vets, but I still personally did not know what to expect, especially since I'm a tad awkward when meeting new people. 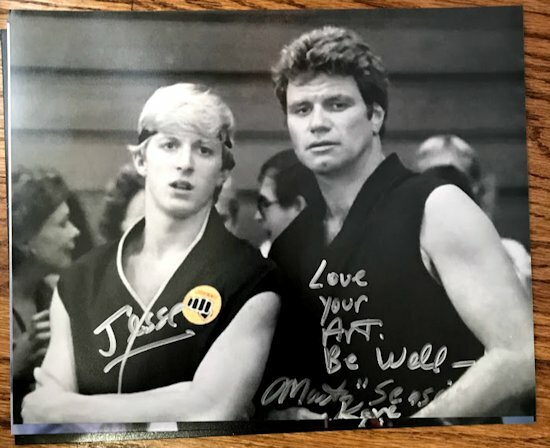 I just knew that being the Karate Kid fan I am, I had to meet Martin Kove and William Zabka. I was blown away at how personable and gracious they both were. 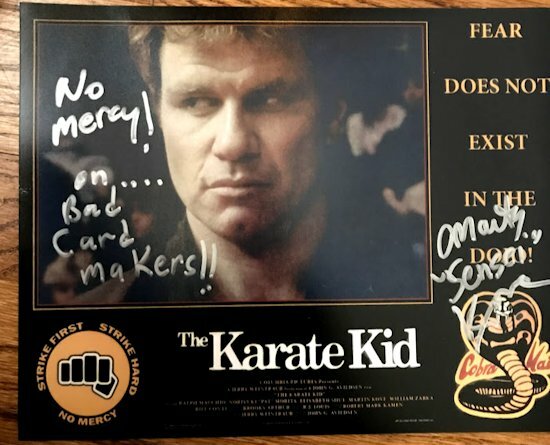 Mr. Kove told me his son's name was also Jesse and we chatted a bit about old westerns seeing as my dad, the western fan he is, got my name from Jesse James. Not only did they take a real interest in everyone's item and exactly how they would like it signed but they also chatted nearly everyone up and were happy to take pictures. There is no doubt that they wanted their fans to leave with a great experience. As I found in subsequent trips to the Comic-Con that that's not always the case. Some guests merely sign and "next" to the person behind you and are sure to let you know what will cost you extra. I get the business side of it, but at least make an effort to make that part of it not so overt. Definitely not the case with Kove and Zabka. Both of those guys are genuine. 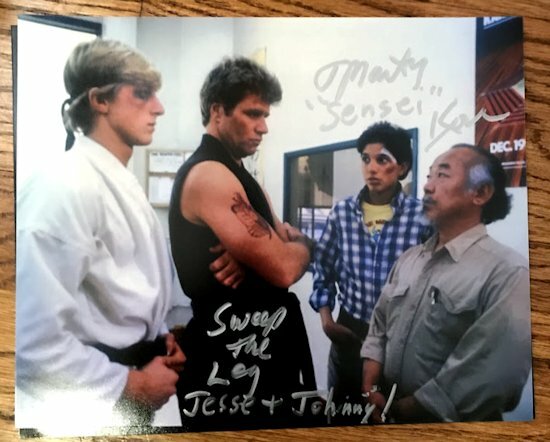 I was so impressed that when they returned the next year (with Ralph Macchio) that I again paid for an autograph and got a chance to make small talk with a couple of my childhood heroes. 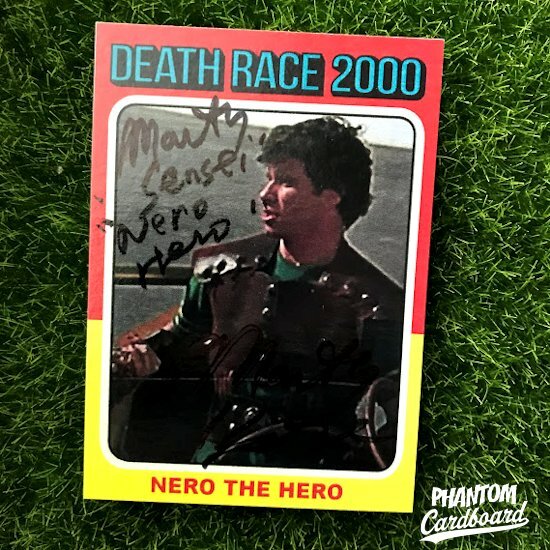 My standard practice when I send cards to celebrities in hopes of an autograph is that I always include a copy for them to keep as a token of my gratitude. When I got my return from Mr. Kove let's just say he appreciated the gesture. 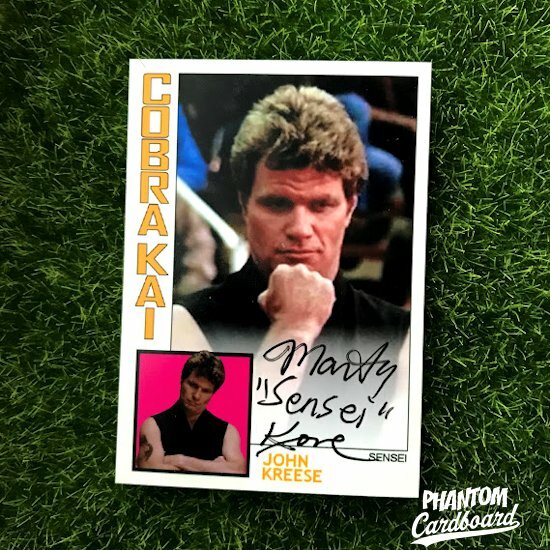 Instead of my 6.75" self addressed stamped envelope I got a legal sized manila envelope chock full of signed and personalized 8x10s and of course my 1984 and 1989 Topps-style Sensei Kreese cards. Most all of the photo's inscriptions had something to do with the cards. I really couldn't believed that he liked them that much. He was even requesting more to give to his friends and family. 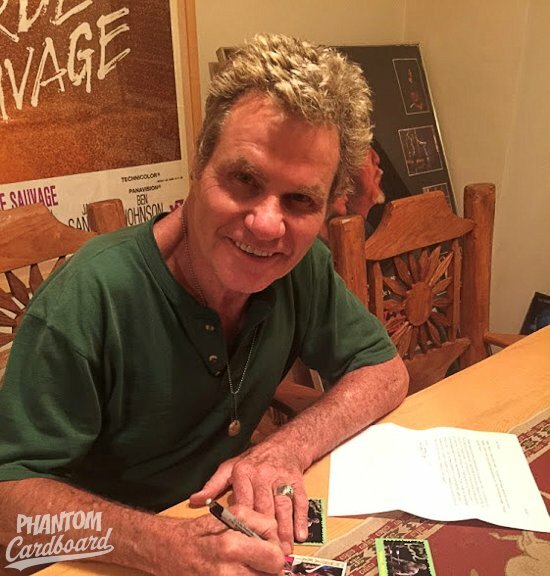 Each time I would send Mr. Kove more cards I would try to work on a new one of him, and every time he was as complimentary as the first time. Not to mention emailing me the picture above of him signing my cards. 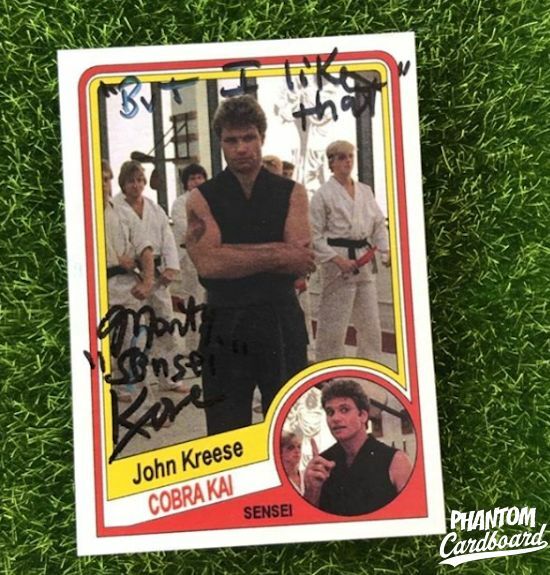 I cannot wait until next year when the Karate Kid sequel - entitled "Cobra Kai" - comes out on YouTube. I'm not 100% sure if it will feature Sensei ...but I sure hope it does. 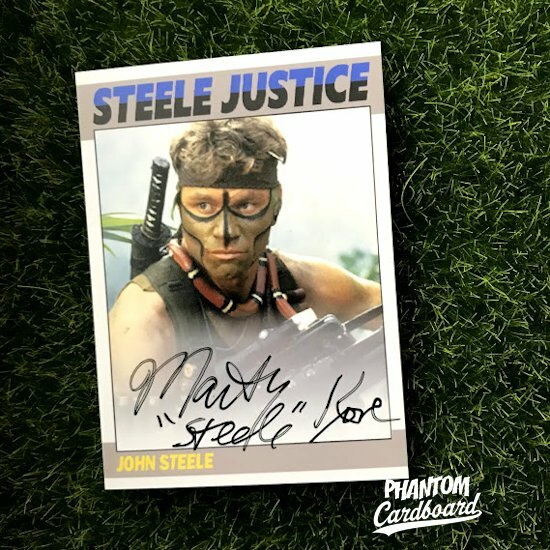 I was always and forever be a "Martin Kove guy". Anyone who takes that much time and is as complimentary as he has been to me automatically has my loyal fanhood.